Published by SILICONETICS RESEARCH CORPORATION SDN. BHD. Deep Flash is a multi-layer flash cards memory games. 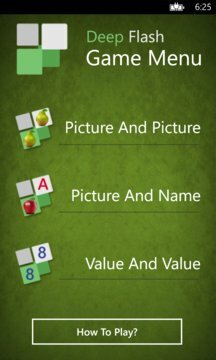 Just like other flash card game, "Deep Flash" require you to use your memory to find and match pairs of objects hidden under the cards as fast as you can. The difference is the cards in "Deep Flash" is organized in several layers. In addition "Deep Flash" also provides matching between the "image and name" and the "value and values​​" aside from the usual matching "pictures with picture". The score is determined by the time spent and the number of tries to completed the games. In version 1.1 Deep Flash was upgraded to support all screen resolutions. Deep Flash was developed by Siliconetics Research Corporation Sdn. Bhd. For more information about us, please visit our website at http://www.srcsb.com.